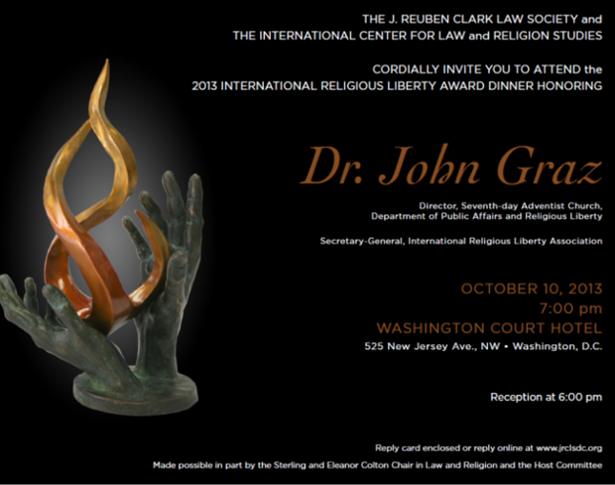 The J. Reuben Clark Law Society and The International Center for Law and Religion Studies cordially invite you to attend the 2013 International Religious Liberty Award Dinner honoring Dr. John Graz, Secretary General of the International Religious Liberty Association. An educational program on religious liberty will be presented at 6:00 pm. Made possible in part by the Sterling and Eleanor Colton Chair in Law and Religion and the Host Committee.